Well, for a lack of anyplace better, since this site is the only forum that belongs to me, these are going to be my personal pages. They may be better than a shoebox full of old letters, half mouse-eaten, found in some musty attic. Maybe. Not as dramatic, for sure. Nothing is as fascinating as a crinkled old piece of paper containing some ancestor's innermost thoughts. This may be a poor version of that, but the ideas will be cast more widely. And son Trevor will fill in the written stuff that doesn't get in here. If he hasn't already! "Personal pages" doesn't mean 'private', as anybody from Australia (that's you, Ernie) to Zimbabwe can read 'em. But it means that it's stuff about my life that doesn't have anything to do with South Mt. Web Design. Just free-rambling stuff that has to do with life. Mine, and maybe yours too. I started the NMTA web site in (about) 2001. Over the years, quite a few photos were put on the site. Then I passed the site on (Gen 2) and now it's in Gen 3. Somewhere along the way, the stuff got lost. Well, it's baaaack. Might be good for a giggle or two. Also, there is a gallery which is mostly old photos scanned by Bud Cole, with a few albums of more modern pictures. About 1500 of 'em. Includes a bunch of really cool flyers. The earliest are from the early 70's. If you go there, realize that there are thumbnail photos, then medium-sized 'intermediate' photos, then if you click on the intermediate, the full-size original authentic whole-thing picture pops up in all its glory. And you can save it if you want! MANY thanks to Bud for the tremendous amount of work he put into this! 1969, A Honda 125 trip, Michigan to San Diego, to Seattle, to Idaho. Writeup coming in 10 years or so. Ok, here are some quick pdf scans of the original article in Road Rider, 9/1976..
Bonneville 2010 A similar trip to 2009, but son Trevor accompanied me on a classic Yamaha SRX6. I spent 10 years with the Forest Service working on fires, and often setting them (controlled burns) during the off-season. Here's a starter page on the St. Joe Fire Crew, 1968 - 69. A U.S. Forest Service 25-man crew based out of Clarkia, Idaho. I was really lucky to get on it. I knew for sure I was done in '69, got drafted into the army in 1970, got out in 1972, and went back to fire for 8 more years. For some of those years, I worked in the Southwest (March-June fire season) then went north and worked June-Sept. My Mother's two brothers were city firefighters in Duluth, MN. Is there a connection here? 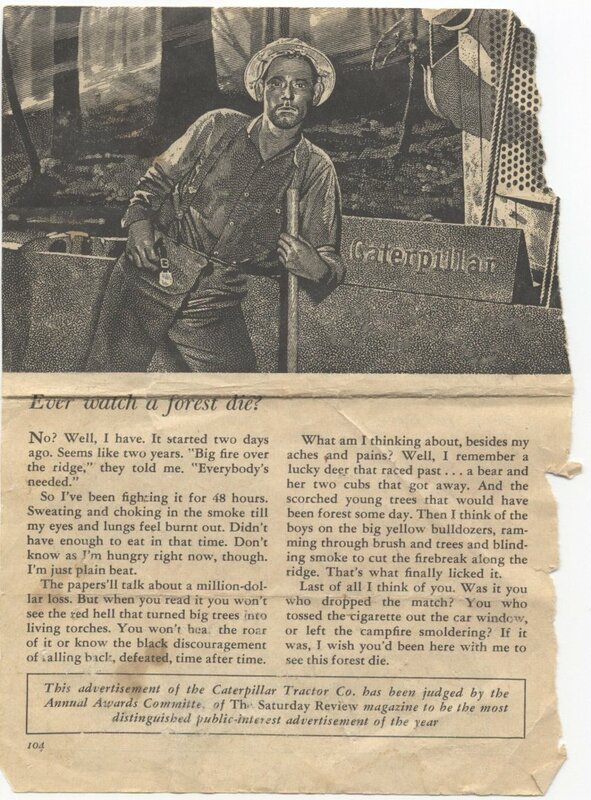 What about this ad I tore out of a Reader's Digest when I was about 11 or so? Well, I still have it. Planted a seed? I've always loved flying, since my first flight in a turboprop going to D.C. from Michigan on a high school senior trip ('66). The guy in the window seat had bruise marks from me climbing over to see out the window. Forest Service helitack sealed the deal. 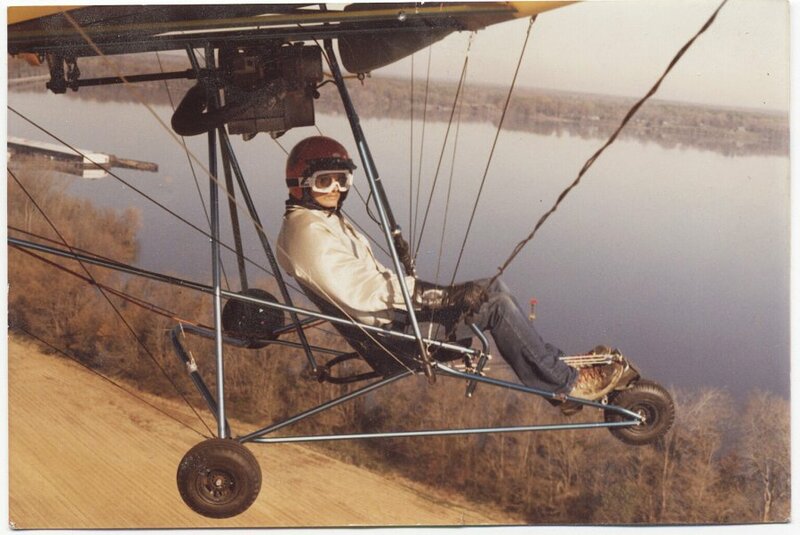 I completely drained my GI Bill on flight training, flew for a roofing company, then did a stint instructing in ultralights out of Kitty Hawk, NC (where the foolishness all began). Bob's note: Trev slipped in the introduction, it's not mine. Much better than I did originally, mine's gone, trash. Collaboration, or the hazards of sharing web space. Anyway, there are lots of musty old things that he's going to discover sooner or later, paper and photos in the chests out in the shop, flight stuff, firefighting gear, my diaries (as spotty as they are), my Dad's WWII medals, lots more. All in a musty old shoebox.